I was for it – before I was against it. 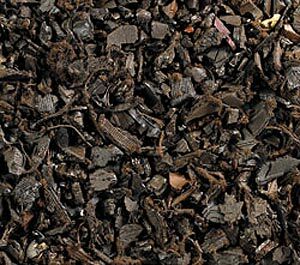 I’ve recommended rubber mulch as suitable for use around swing sets and other areas where children play, maybe a small, outdoor dog-related area, etc. One would never use the product – made from recycled tires – around plants, of course, because the product doesn’t break down and add organic nutrients to the soil. I have a “Don’t DO That” that I tell to everyone who will listen: “Don’t buy rubber mulch.” It isn’t mulch, it’s a distributed chemical spill. UV and heat will break down the rubber over the years, and it will be dispersed into the environment, petrochemicals and all. As it mixes in with organic material, it becomes harder to separate. It is simply the dumping of tires into the environment, but in a broken-down, partially digested fashion. I did a little research, and Brian is right on. And man, to heck with swing sets, think about the people in America spreading this stuff around the plants in their landscapes! The stuff breaks down and adds organic material, alright: petroleum oil. So to the list of weed barrier fabric, Japanese barberries, gravel mulch, pesticides and fungicides with high EIQs, and other items sold by the gardening industry that a good Renegade Gardener should never use, we now add: rubber mulch.